The first step to seeing a orphaned child’s life changed is the consistency of three hot meals a day from a loving caregiver. Once these children have full bellies, they can begin to grow healthy and strong. Then they can learn and understand that God loves them very much and that they have a bright future ahead. 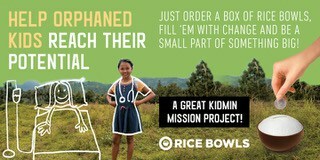 Rice Bowls are a fun and free way for your group to provide nutritious food to orphaned children. Giving and service are intangible concepts and can be difficult for kids (and adults…) to grasp. A Rice Bowls campaign is an easy way to bring these concepts to life. Plus, you’re helping our partner homes rescue, love, and feed the kids in their care. Tony Kummer (Editor) reviewed & updated this page on : October 25, 2018 at 8:02 am. All our content is peer reviewed by our readers, simply leave a comment on any post suggest an update.